Job Loss, Wage Stagnation, Low Productivity: We’re Great Again! Since then, regardless of the playground-like antics in our nation’s capital, or maybe because of them, not much has changed. So, in this post I want to discuss some of the factors and trends that have contributed to this economic wage crisis and suggest it played a powerful role in the rise of Donald Trump who, with rhetoric as sharp as the edge of an axe, seized on the frustration and outrage within the lower wage working classes whose nearly biblical devotion led to his election. That it is a crisis has been borne out over time by a mountain of complex research that cannot be explained in a tweet. The latest brick in this ugly house was laid last week with the release of a study from The Hamilton Project at the Brookings Institution. In The Hamilton Project at Brookings report, Jay Shambaugh, Ryan Nunn, Patrick Liu and Greg Nantz offer Thirteen Facts About Wage Growth with solid research buttressing each fact. The point of the paper is to explain why wages for production and non-supervisory workers have been stagnant for so long. In order to explain the why, they first had to prove the point. To do that they divided the period since 1981 into four business cycles: 1981-90, 1990-2001, 2001-07 and 2007-17. They found that in the first three of those business cycles nominal wage growth (wage growth without any adjustment for inflation) averaged just a bit above 3%. In the last cycle, which started at the beginning of the Great Recession, growth has been 2.34%. 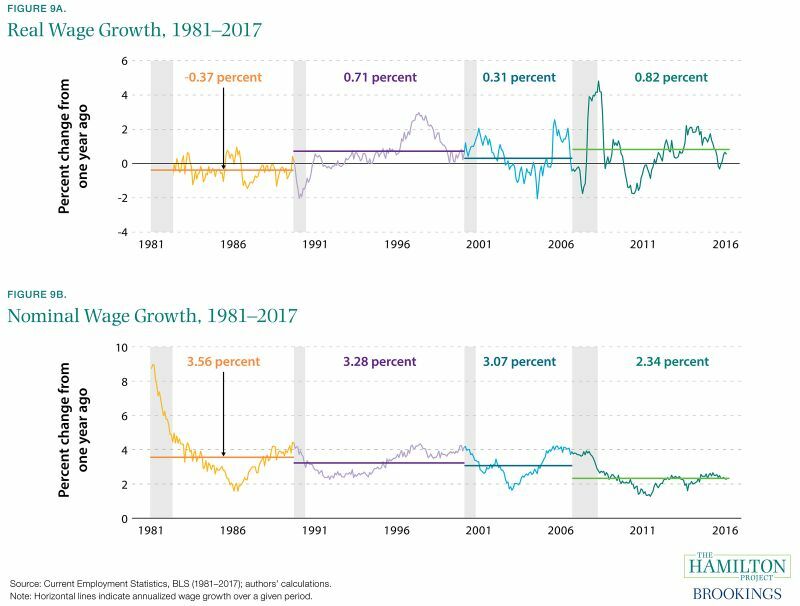 However, when one considers real wage growth (growth adjusted for inflation) each business cycle saw wages increase significantly less than 1%. Despite this 36-year run of bottom-of-the-bird-cage wage growth, according to the Bureau of Labor Statistics’s Inflation Calculator, what you bought for $1.00 36 years ago in 1981, the first year of this study, cost you $2.84 in September of 2017. This puts American workers in the position of trying to outswim a Navy Destroyer. Every moment they fall farther and farther behind. The authors point out that our long-term wage stagnation can be traced to many trends, including the decline in US workers’ share of income. The portion of national income received by workers fell from 64.5 percent in 1974 Q3 to 56.8 percent in 2017 Q2. Over the past few years the U.S. labor share has ceased falling, but this might reflect the ongoing economic recovery rather than any change in the long-run downward trend. Union Membership: In 1956 about 28 percent of all workers belonged to a union; in 2016 that number was a little more than 10 percent. In the private sector, union membership has dropped to 5%. Regardless of what you think of unions, the fall in union membership directly correlates to an increase in wage inequality. The Real Minimum Wage: The Project Hamilton Report demonstrates how insidiously the federal minimum wage has limited wage growth among low wage earners. Since 1968 the real minimum wage (minimum wage adjusted for inflation) has fallen more than 20%. Right now state minimum wages range from a low in Georgia of $5.50 to a high in the District of Columbia of $12.50. A number of states have passed legislation to gradually increase their minimum wage over the next few years. Others have indexed theirs to the CPI. Regardless of what the states do, their minimum wage cannot be lower than the the federal minimum wage of $7.25 for any worker covered by the National Fair Labor Standards Act. If a worker in Georgia isn’t covered by the Act, however, $5.50 reigns. 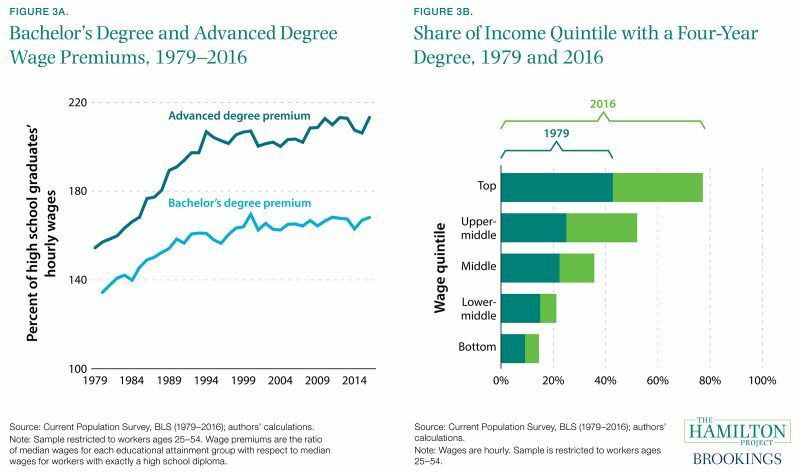 The Education Premium: The wage benefit of a college degree increased dramatically during the last two decades of the 20th century, leveling off around 2000 at an historically high level. Bachelor’s degree holders ages 25 to 54 in 1979 could expect to earn 134 percent of the wages received by those with only a high school education, and advanced degree holders could expect to earn 154 percent. By 2016 the wage premiums for a bachelor’s degree and an advanced degree had risen to 168 and 213 percent, respectively. Another way to look at the wage value of higher education is this: Although only 40% of the nation’s workers hold four-year college degrees (23% in 1979), in the top two earnings quintiles college graduates make up a clear majority, 78% in the top quintile. Only 15% of the bottom quintile are college graduates. One last point about the Education Premium: In its most recent survey of college pricing, the College Board reports that a “moderate” college budget for an in-state public college for the 2016–2017 academic year averaged $24,610 (tuition, board and fees). It’s true that financial aid is available to most students. However, with the income of today’s low-wage earners falling farther and farther behind workers sitting serenely much higher on the economic pyramid, how do you think they’re going to manage to send their children off on a quest for a four year college degree, even at an in-state public college? This is a self-perpetuating educational death spiral. Maybe you’re asking what this has to do with workers’ compensation? Well, if US workers on the bottom half of the income scale have seen their wages lag behind the CPI for four decades, they are right now hard pressed to contribute to the country’s economic growth and viability. Moreover, when one of them suffers a lost-time injury at work, that worker will suddenly see his or her take home pay reduced because of state workers’ compensation laws, which will make it even harder to support a family. Research shows this, among other things, contributes to underreporting of workplace injuries. For more information on this issue, see Bureau of Labor Statistics data and a recent New York Times economic report by Ben Casselman. I have a hard time believing decades-long negligible wage growth, especially for those on the lower end of the income scale, can be anything but harmful for America, its economy and the quality of life of its workers. I suggest this is a significant cause of the frustration and outrage that led to the rise of the Tea Party and Freedom Caucus. Donald Trump saw this frustration, this outrage, as a mammoth opportunity and continues to feed it like red meat to a hungry lion. That type of divisive behavior can be nothing but destructive. But until our elected officials grow enough spine to do something meaningfully constructive and productive about it, I fear this situation will continue to divide and erode us as a nation. That is terribly sad to contemplate. Posted in Research | Comments Off on Job Loss, Wage Stagnation, Low Productivity: We’re Great Again! 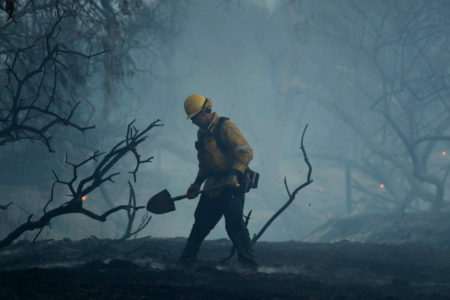 Check out the latest Health Wonk Review: Disaster edition freshly posted by David Williams at Health Business Blog. David is a long-time HWR host and his business blog is a strong and authoritative voice in the health business sector – if he isn’t on your regular reading list, you should change that! Another issue we’ve posted about previously is the death of cell tower workers. We were interested to see that Washington state recently adopted tower safety worker rules – the third state in the nation to do so. The National Academy of Social Insurance (NASI) recently issued its 20th annual report on Workers’ Compensation: Benefits, Coverage, and Costs. 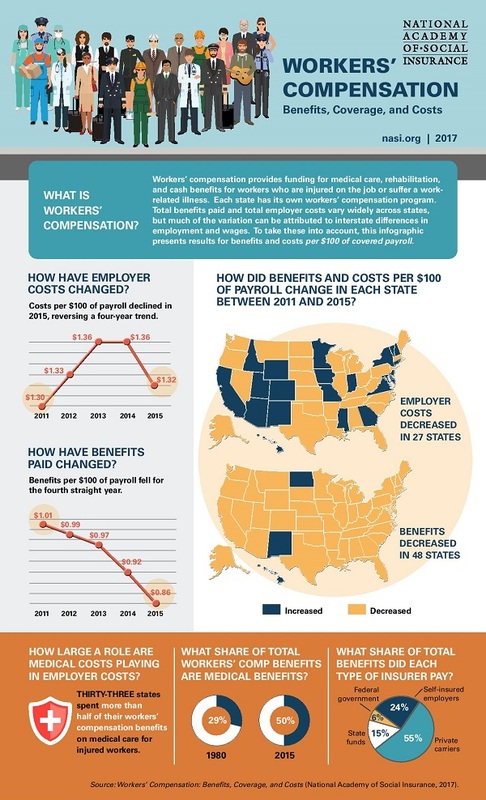 The study provides estimates of workers’ compensation payments—cash and medical—for all 50 states, the District of Columbia, and federal programs providing workers’ compensation. Benefits per $100 of payroll fell from $0.92 in 2014 to $0.86 in 2015, the lowest level since 1980. Workers’ compensation employer costs per $100 of payroll dropped to 1.32 in 2015, reversing consistent growth that began after the recession. In 2015, workers’ compensation coverage extended to an estimated 86.3 percent of all jobs in the employed workforce, comprising more than 135 million workers. Employer costs per $100 of covered payroll increased in 24 states and decreased in 27 states. West Virginia, Montana, and Oklahoma experienced the largest reductions, with costs dropping more than $0.30 per $100 of covered payroll. Employer costs increased by more than $0.20 in Wyoming, Delaware, and California.